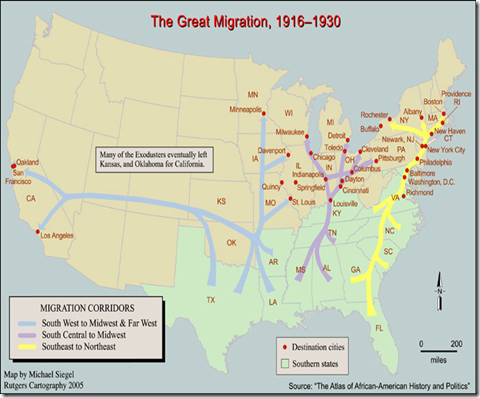 The Great Migration urbanized the southern African American population and expanded blues music from the southern states to the rest of America. The map below shows the patterns of mobility from 1916 to 1930, with many families leaving for destinations like New York, Chicago, Philadelphia, Minneapolis, Newark and even Providence. As blues musicians moved north and became successful in their craft, it attracted other southern African Americans to migrate as well. The Great Migration; which was brought upon by crop devastation, formation of the Klu Klux Klan, Jim Crow laws, and the US entering WWI and WWII (which demanded more labor in the Northern states), created a new market for the music industry. The main areas they migrated to included, Chicago, New York, and California. Through the migration, blues music evolved and created many different styles of music, including many of our modern genres today. Chicago was, and still is, a central location for blues music. Because many performers had migrated from the Mississippi region, Chicago blues is largely influenced by the Mississippi blues style. The style can be characterized by their use of electric guitar, harmonica, and a rhythm section of bass and drums (sometimes saxophones as well). As the Great Migration continued the lyrics and tempos of their songs became up-beat and lively. We were shown two examples in class, one titled ““Rolled & Tumbled” by Rose Hemphill and another titled, “Rollin’ & Tumblin’” by Muddy Waters. The first song gives the impression of sadness and depression, the other gives the feel of happiness and change; these differences are common during the Great Migration as people discover freedom and inspiration in northern cities. 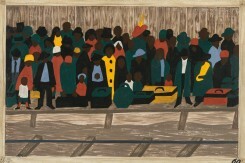 In New York City, during the Great Migration, a lot was happening. 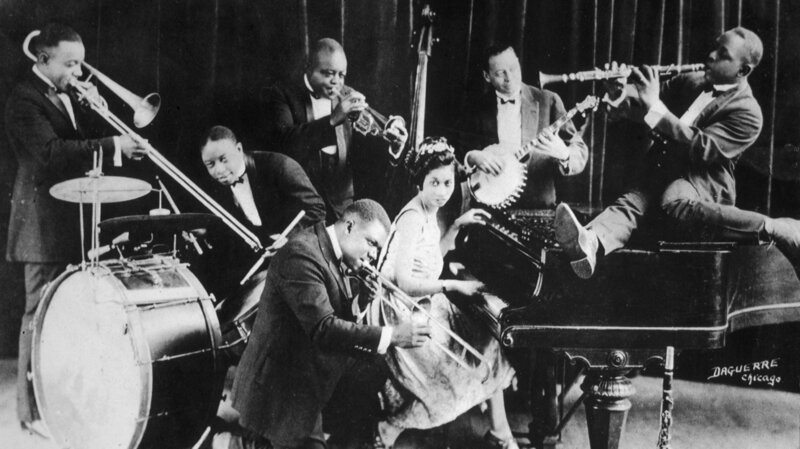 The Harlem Renaissance during the 1920s and 30s played a major influence on blues and jazz music. The traditional southern brass instruments were being played with pianos, which were considered to be a wealthy instrument. Innovation and liveliness were inspiring performers all over the city, the new found freedom resounded in their lyrics and music style. In 1920 Mamie Smith changed the blues scene when she recorded “Crazy Blues”. The record sold over one million copies and allowed for many other artists to follow suit. It was said that, “we can’t conceive of modern popular American music without these early blues performers and songs… and Mamie Smith was the first one to record this kind of music” (npr). After her, some of the greatest blues women of the 1930's followed, including Bessie Smith and Ida Cox. The invention of portable electronic recording devices made it possible for recording companies to recruit new artists and allow more people to discover the blues. King Oliver's Creole Jazz Band in Chicago in 1923: Louis Armstrong is kneeling, from left to right behind him are Honore Dutrey, Baby Dodds, King Oliver, Lil Hardin, Bill Johnson and Johnny Dodds. After the Civil War, many African Americans migrated from southern states to the North, Midwest, and West, seeking a better life. Though northern and western states were certainly not free from discrimination, they provided far better opportunities for education and advancement than under the Jim Crow laws of southern states. Though this began in the late 1860s, there was a steady increase in the number of migrants until well after the first World War. During World War I, immigration from Europe ceased, causing a shortage of inexpensive industrial labor and a demand for workers. Consequently many African Americans settled in cities, creating neighborhoods such as New York's Harlem and Chicago's South Side. Some of these migrants were aided by former slaves who had already settled in northern cities or who had recently returned to the United States after fleeing to Canada. Rural agricultural workers became urban dwellers, fashioning a very different life for themselves. What came to be called the "Great Migration" peaked in the 1920s when hundreds of thousands of African Americans left the South. The migration caused conflicts and a demand for civil rights. The National Association for the Advancement of Colored People was founded was founded in 1909, partly as a response to the consequences of the Great Migration. From a musical point of view, this migration brought Gospel and blues music to a wider audience, and northern and western cities became a place for African American musical innovation. The search for a better life also led to changes in the way performers chose to present themselves. For example, singer Noble Sissle refused to perform in black face, which, at the time, was still common for African Americans. Marian Anderson, whose grandfather had migrated to Philadelphia shortly after emancipation, studied opera and, when she performed traditional spirituals, she did so in a trained vocal style. Composer Spencer Williams is an example of an African American who migrated from New Orleans to perform and live in Chicago and later New York during the Great Migration. Listen to his song, "I Ain't Got Nobody" performed by Hattie Ellis. Another wave of African Americans to the north and west occurred after World War II. An example is blues great Honeyboy Edwards, who left the Missisippi Delta to live and perform in Chicago in 1950. Listen to him sing "Sweet Home Chicago," a song believed to have been written by Robert Johnson.